Summer is most definitely my favourite season. As soon as we get even a tiny glimpse of sunshine I have to head outside and make the most of it. I have yet to find a solution where I can work outdoors with my laptop but if the sun's out, I'll almost always enjoy lunch in the garden at this time of year. There's nothing like the feeling of the sun on your skin to give you a bit of a lift when you're stuck home alone all day. 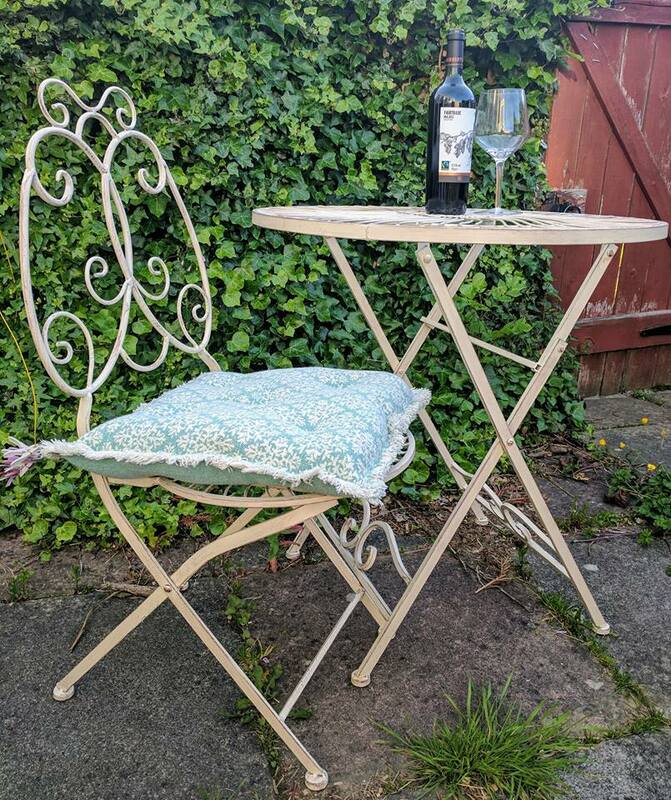 It's mostly just me at home during the week by myself and I'd been on the look out for a small table and chair set that can easily be folded away or brought out at the drop of the hat. The British weather can be so changeable and at the moment it feels like we're in a storm one minute and then it's brilliant sunshine the next. I almost bought an Aldi special set a few weeks ago but you know what their deals are like - once they're gone, they're gone. I didn't have access to our car as Steve was working long days so unfortunately missed out. Not to worry though - everything happens for a reason I think! We were in TK Maxx browsing plates (more about my obsession later) when I spotted the perfect set for just £79.99. I had to buy it straight away as it was just what I was looking for. It folds up and I keep it in my conservatory but it also looks very pretty too. 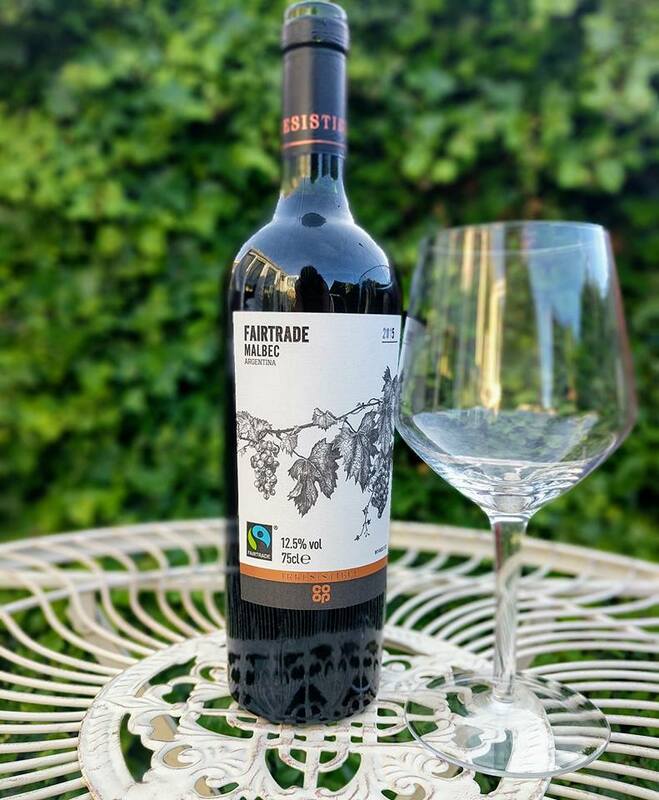 Not only is it the perfect set for enjoying a quick lunch outdoors, but as it comes with 2 chairs, it's perfect for Steve and I to enjoy a glass of wine in the garden and catch up after a long day of work. I am honestly so pleased with it! I got a bit carried away in store though and bought some lovely cushions to go with it, only to realise when we got home that they were covered in snowflakes! Ooops! Oh well, they don't call me Queen of Christmas for nothing! Regular readers of our blog will know that Saturday nights in our house are family night. We tend to either order a takeaway or cook a treat meal together. Another reason I love summer is that we get to enjoy a weekly BBQ (subject to no rain of course). We love our new gas BBQ and wish we'd made the switch ages ago. We're busy people and Steve works until 6pm most weekends so being able to cook outside without the hassle of remembering to buy coal or fire lighters and with no waiting around for the perfect temperature really appeals to us. 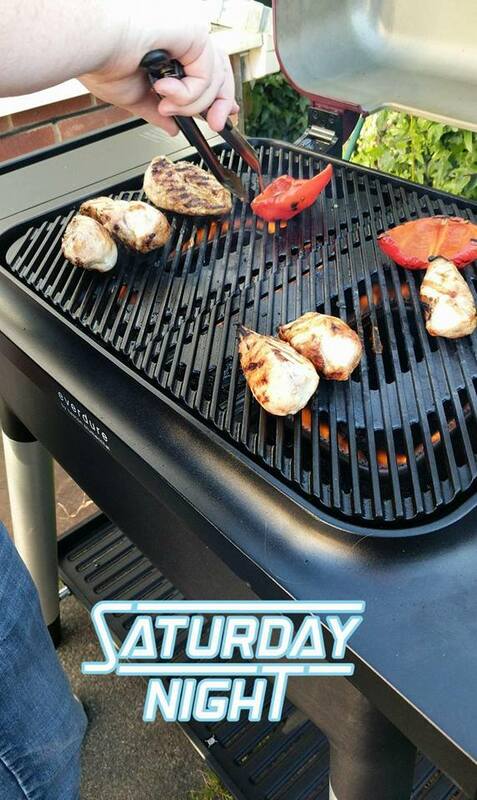 We enjoyed BBQ chicken fajitas last Saturday night and they were so good - food always tastes better when cooked outside I think. Finally, onto my obsession with plates. 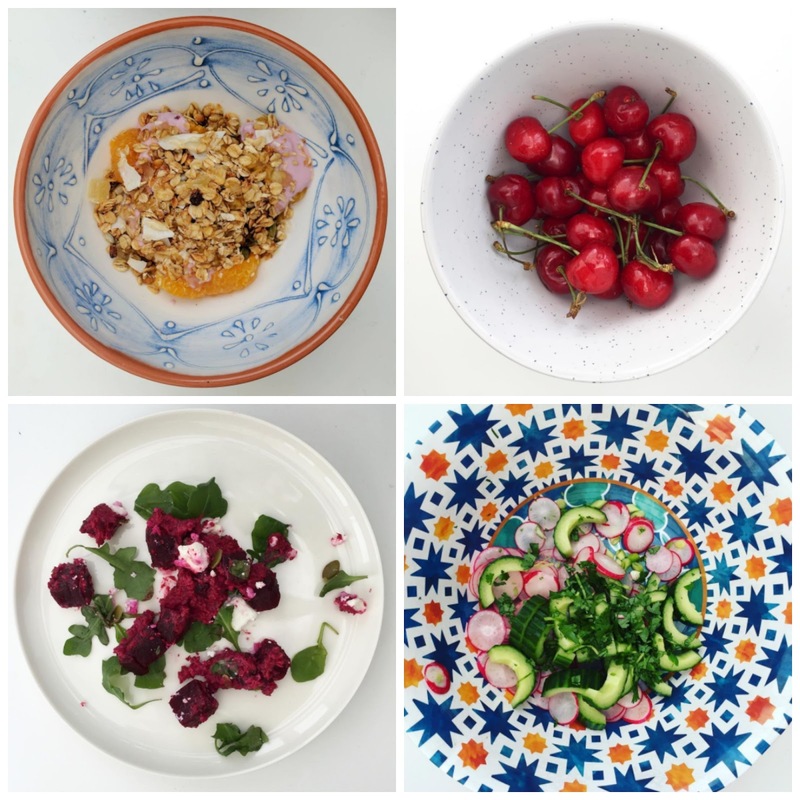 The summer months see an influx of beautiful picnic plates and tableware in the shops and if you follow my foodie Instagram account, you'll know that I have a little bit of an obsession with pretty plates. My latest find to add to my collection are these gorgeous picnic plates from TK Maxx - around £2 each so not expensive at all. 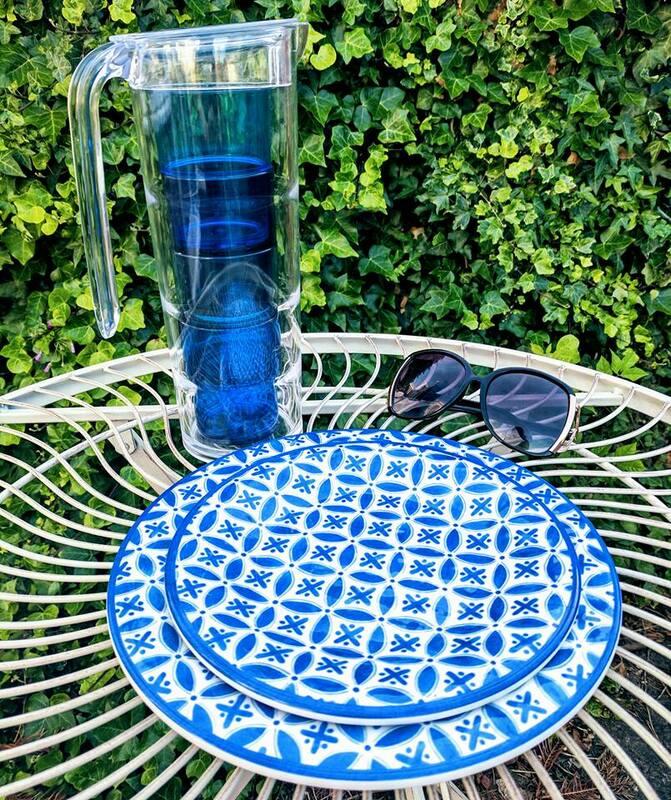 I love the picnic jug and cups I bought with them to match and think the kids will love leaving this on the table when they're playing outside. 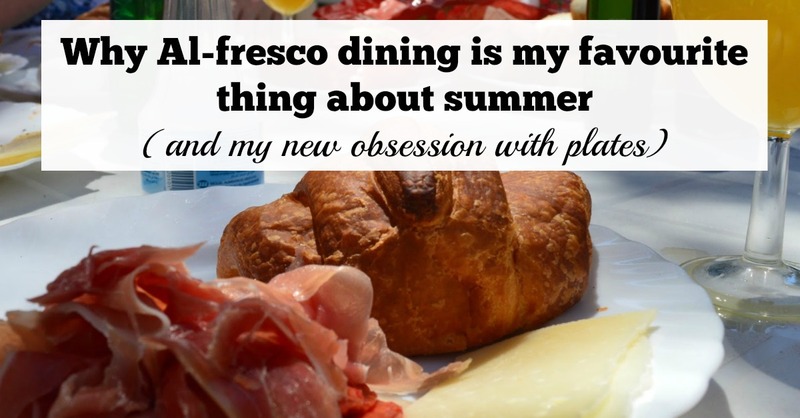 Let me know if you enjoy Al Fresco dining just as much as we do and if you have an obsession with buying picnicware and pretty plates too. Those plates are gorgeous! I am so looking forward to more BBQs and salads now it's warmer! Those are beautiful colorful plates. I love them. Good point on just buying one of each. You get to save and collect variety of designs. You really do have the best eye for beautiful plates! You're forever making me want to go shopping and find some myself! When are children ready for their first LEGO set?